Now it’s time to introduce an easy and effective three-step approach that will work with any organizing challenge. Remember that the goal of organizing is to arrange your possessions to support what’s important in your life now. You can actually harness the power of your possessions in order to live a better life. The organizing process must always be grounded based on your goals and what is truly important to you. As a professional organizer, I don’t have an agenda about what stuff you should get rid of, or how the stuff you keep should be arranged. Instead, I’m really interested in helping you reach your goals. In general, it’s easy for an objective bystander to look and see whether the specific actions you are taking are getting you closer to reaching your goals. For example, if you want the surface of your desk to be clear and uncluttered, but have a habit of making piles of papers on your desk, then that habit is taking you further from your goal. If you were in San Francisco, and you said you wanted to go to Los Angeles, which is south, but then you started driving north over the Golden Gate Bridge, I’d say you were going the wrong way. It’s not that there’s anything morally wrong with doing what you’re doing, and of course the Golden Gate Bridge is a beautiful site to see, it’s just taking you further from where you say you want to go. As a way of laying the foundation for the easy and effective three-step approach to organizing, I will now introduce three principles of organizing. Principle number one: The smaller the quantity you are working with, the easier it is to organize. In other words, it is easier to organize a smaller amount of stuff. The fewer items you have, the easier it is to get organized. Principle number two: Memory is Associative. The mind can keep track of fifteen categories much easier than it can keep track of five hundred eighty-seven individual objects. Furthermore, the mind remembers information through its relationships to other pieces of information. Your mind will keep track of your stuff through its relationships and connectedness to other stuff. And finally, principle number three is what I call the frequency of use principle. For greatest efficiency, Items which are used most frequently should be most accessible. Based on these principles, I have created an easy and effective three-step approach that works for any organizing challenge, whether it would be a garage, an office, a purse, or a car. I call it “The Three S’s of Organizing.” The Three S’s are Simplify, Sort, and Store. The first S is simplify. Simplify means to make life simpler by eliminating anything that is not serving you, that is not supporting your vision of what’s important in your life now. Examples of simplifying would include getting rid of food which is beyond its expiration date or a user’s manual for a product that you no longer own. The second S is sort. Sort means to create categories, and put like things together. For example, you might put all office supplies together and bicycling equipment together. The third S is store. Store means to create a home for each category and then store that category in its home. The most important factor in creating the home is that you want the categories you use most often to be most accessible. For example, items that you use every day, like your keys, pens, and maybe a letter opener should be right at your fingertips, while things you don’t use very often, like old tax returns, can be stored out in the garage or in a storage unit. Beyond that, there are two other less important criteria to consider. You also want the size of the category to roughly match the size of the storage space. For example, you wouldn’t place large pillows in a small desk drawer. And finally, ideally the category would be positioned near where it will be used. For example, you might store the office supplies in the office and the bicycling equipment in the garage. The first two S’s, Simplifying and sorting, are not necessarily done in that order. Either may be done first, or they may both be done together. Sometimes it’s easier to simplify first, so you don’t spend time sorting things that you’re not even going to keep. However, if you’re having difficulty simplifying, I recommend sorting first, because sorting will give you a better sense of what you have, and knowing what you have will make it easier to simplify. Also, the sorting will help you see when you have redundant possessions and therefore make it easier to simplify. For example, if you find that you have three copies of the same book, it may not be necessary to keep all of them. I’ll be talking a lot more about each of these three steps in future posts, starting next time with “Simplify.” Until then, may you continue living a life of meaning and value. It’s easy to overcome this danger. I want to let you know about it so that you’re not surprised, and because awareness of it makes it easier to overcome. At the start of an organizing session, I always sit down with my client somewhere away from the area to be organized. I look them in the eye and ask them the same questions I asked you in the last podcast. •	What things are important to you right now in your life? •	What would you like to accomplish? •	What makes you happy? •	What gives your life meaning? At this point, the client is designing their life! They’re going through a creative process. If they could have their life any way they wanted, what would it be like? In this brainstorming and creative process, the client is in charge, they are evaluating alternatives, making decisions, and creating their life based on what is important to them. What I have found, however, is that when we enter into the area to be organized in order to implement the plan, there is sometimes a subtle shift that takes place. The client looks around the room, sees all the stuff around them, and starts responding to whatever their eye happens to fall upon. They start responding to the stuff, instead of compelling the stuff to respond to them. The individual items begin to exert some influence, and sometimes the vision gets lost in that collection of objects, like not being able to see the forest for the trees. Instead of moving toward their vision of how it could be, they’re responding to what’s already there. It’s almost as if the stuff is in charge. Of course it may happen that when you look through the stuff, you will be reminded of something that genuinely is important. In that case, it’s a simple matter to go back and add it to the list. What generally happens, however, is that the item, although an interesting detail, really isn’t important in terms of the big picture. It’s important to maintain the big picture perspective in the midst of all the details. If the details crowd out the big picture, it’s easy to lose direction. 1. First, the boxes of tapes took up a lot of space and she wanted that space to set up an easel to pursue a new hobby. She was very passionate about painting and having this extra space for her studio was her main reason for organizing. 2. Second, she had listened to all these tapes in the past and had no intention of ever listening to them again. 3. Third, at this point she didn’t even own a cassette player and wasn’t willing to buy one in order to be able to play them. 4. And therefore, fourth, she wanted to get rid of most of the cassette tapes and keep less than 10% of them. Do you see what happened? Some aspect of each individual object appealed to her in such a way that it diverted her from the path she wanted to be on. These possessions somehow had her doing the exact opposite of what she had intended to do. You can call this influence whatever you want, but I call it “the seductiveness of stuff.” In any case, it was clear that if she continued in this way, she would not reach her goals. I have found that we are more vulnerable to “the seductiveness of stuff” when we become predominately outward-focused. Let me explain. In the last podcast, you looked at what is important in your life. This is essentially an inward process. It helps to be introspective and reflect so these priorities come from the deepest part of yourself, from your heart. When you look at an object, the danger is that you put so much attention on the object itself that you lose touch with yourself in the process. This is what I call outward-focused. When you are outward-focused, you may make decisions based on what’s in front of you, even though those decisions are not congruent with who you are and what you want. If you forget what’s truly important to you, then everything looks important. On the other hand, if you view the object from the perspective of who you are and what’s important to you, you are more likely to be able to succeed in reaching your objectives. This was the case with Sherry. With the techniques I describe in these podcasts, I was able to support her in making decisions that led to her reaching her goals. •	First, always remember your objectives when making decisions about your stuff. View your stuff from the perspective of who you are and what you want to achieve. •	Second, remember that there is no value in life except what you choose to place upon it. You have the power at every moment to assign value to an object and evaluate how it supports what’s important in your life. •	Third, keep with you, ideally in your pocket, the list of life priorities you created in the last podcast. If you start to become too outward-focused, take it out and look at it. It will remind you of your big picture objectives. How can stuff be so seductive? I believe it’s not the stuff itself, but what the stuff represents, and I’ll discuss this more in the future. Until then, may you continue living a life of meaning and value. Previously, I defined organizing as “Arranging Your Possessions to Support What Is Important to You Now.” Therefore, your first step in organizing must be to be very clear about what is important to you now. When people are on their death beds, they never say “I wish I’d spent more time at the office” or “I wish I had bought more electronic gadgets.” It just doesn’t happen. Instead, people in the final moments of their lives tend to be very clear about what is really important. Studies and interviews indicate that people universally feel contented or regretful about two main areas of their lives. The first is their relationships with others. The second is the contributions they have made, the way they shared their own unique gifts, and, in so doing, made the world better place. But please don’t wait until the end of your life to get in touch with what really matters. We don’t need a major life transition to do this. We can reach the same clarity through foresight and reflection as we can from hindsight. It’s never too early to consider what is truly important. Let’s start right now. I invite you to take a pen and paper and participate in this simple exercise that will help you consider what is truly important in your life. You’re going to look at these four areas of your life: professional, social, health, and leisure. For each area, you’ll list two or three things that are important with respect to that part of life. Each item can be an activity, a goal, some way that you want to grow, a state you’d like to achieve, or anything else you deem important. You can do this exercise anywhere, although it helps to be somewhere away from your stuff, like an uncluttered room, a café, or out in nature. Let’s start with the professional or work area of your life. Write down two or three things that are important to you with respect to your professional life. Is there anything you would like to do in order to advance your career? Would you like to be better at or change some aspect of your job? Are you satisfied financially? Have you made any plans for retirement? As an example, the three things most important to me in my professional life are, first, to produce more podcasts and make them available via iTunes. Second, to update my website, and third, to continue increasing my knowledge and experience in the field of organizing. When you’re finished with the professional area of your life write down two or three things important to you for each of the three other areas I mentioned. Continue with your social life, including family, community, and relationships. Are there any relatives you would like to be on better terms with? Would you like to be in a relationship or start a family? Next, what is important to you with respect to your health? Exercise, eating well, perhaps? And finally, it’s important for us all to have leisure time, vacations, hobbies, and downtime. Do you enjoy being out in nature? What causes do you feel passionate about? What activities revive you? You may have thought of something that’s important to you in a different category. If so, feel free to write it down as well. The categories I suggested are arbitrary. I just chose them to represent a cross-section of different aspects of life. What makes me happy? What brings joy into my life? Am I living a life true to myself? Am I following my heart? What gives me purpose? What gives my life meaning? What makes me want to get up in the morning? Am I being the person I want to be in the world? Is my life focused on things that matter? Now let’s come back to the list you made of things that are important to you. First, notice what physical objects you need to do each of them. For example, if one of your most important activities is bicycling, you would probably need a bike, a helmet, a tire pump maybe, and other biking equipment. If “socializing with friends and family” is on that list, you may not need any material possessions in order to enjoy that activity. Knowing what stuff is necessary to support what’s important in your life is often illuminating, and it’s also very beneficial to the process of organizing. Now, since you can view all the items on the list with one glance, it’s easy to look at them all and make comparisons between them. Go over this list and pick out some items (about a third of them) that are more important than the others. Put a plus sign next to these items. If you’re having trouble deciding, go with your first impulse. You can always come back and alter your choices later. Now identify some items (again, about a third) that are less important and put a minus sign next to them. Now perhaps you’re thinking that they’re all important. That’s true. Just the fact that an item is on this list at all means that it is important. But look at the relative importance of each item with respect to the others. If you only had time to do a few of these, which would they be? Which ones would you start with? So you’ve split your list into three categories of items, some that are more important, some that are less important, and some that are in the middle. The skill that you have practiced in doing so, prioritizing, is an important skill not only in organizing, but in life in general. We live in an age where there is more information produced every day than anyone could process in an entire year. Many of us are asked to do fifty hours of work in a forty-hour work week. We often have opportunities to participate in more activities that we could ever actually do, and some of us have more stuff than we can get any benefit from. The ability to check in with myself at any moment and determine which of several possibilities is most important to me is an essential skill in living a life that matters. Hold onto this list because I’ll be referring to it in the future. And this list is not set in stone. Feel free to modify it if you ever find that it no longer accurately reflects your priorities. Now perhaps you’re thinking that I haven’t really talked about organizing yet. On the contrary. In my opinion, being clear about what’s important in your life really is the essence of organizing. How else can you arrange your possessions to empower yourself to have a better life? I wouldn’t want you to spend a minute of your time doing any task that doesn’t make your life better, that doesn’t take you closer to where you want to go, that doesn’t make you feel good about yourself. But don’t worry, we’ll get to organizing methodology soon enough. But before we do, there’s one more thing you need to know about. I call it “The Seductiveness of Stuff,” and it’s the topic of my next post. Until then, may your life be focused on what is important. 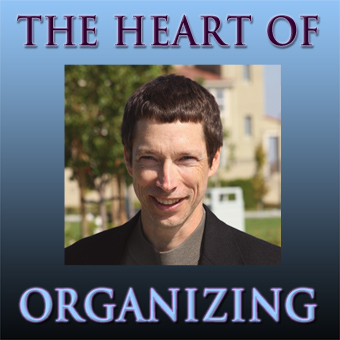 You are currently browsing the The Heart of Organizing: A Blog blog archives for December, 2009.